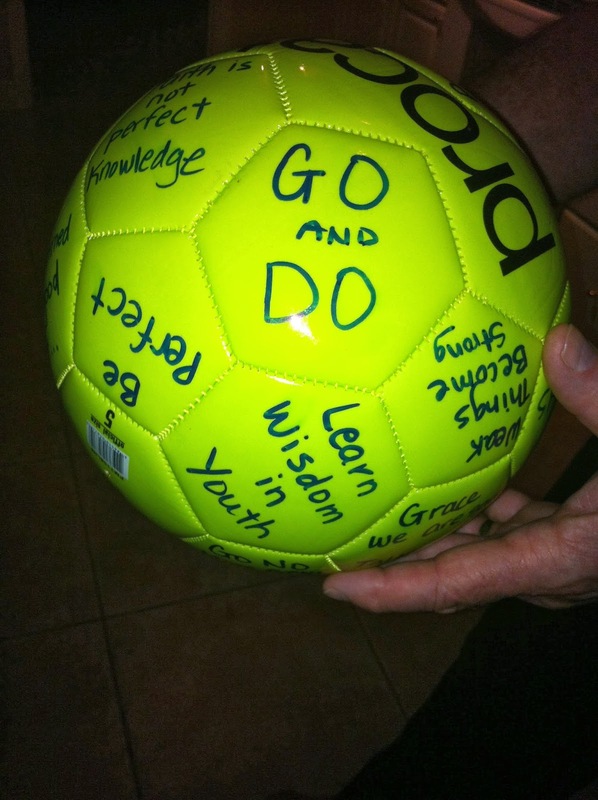 Here is our class Book of Mormon Scripture Mastery BallThe is a soccer ball, but you can use any type of ball. Ask your students if any of them have a spare soccer ball that they can donate to the class. We had one for New Testament and this is something most of the students have asked to have again. Toss, pass, kick, or volley the ball around in “hot potato” fashion. Have a person turn their back to the action and when they stay “STOP”, whoever has the ball checks to see where their right thumb is. The student who has the ball must state which scripture mastery verse matches the key word their right thumb is covering. For an extra point or treat, they have the opportunity to recite the verse. I dont always use this as a game. Sometimes at the end of class when we have a few extra minutes, I will toss it to the class and whoever catches names the scripture matching the key word their right thumb is covering. It is easier to do this in our classroom where we have the keywords on the wall, but they love going in to the cultural hall for more movement and space.